I’ve got a confession for you: I am a terrible housekeeper. It’s true. I am pretty good at purging and decluttering these days, but cleaning? It just does not come naturally to me. There’s only one way my house stays clean. Honestly, setting up systems in our home have made a world of difference for our family. With a plan in place, I’ve got just a couple of things to do each day, which keeps everything from building up on me. Systems are a sanity-saver, plain and simple. They take just a few hours to set up, and then instead of working from scratch every time, you’re just maintaining! We use systems to help lots of areas of life go more smoothly, not just cleaning. So today, let’s talk about why systems matter, before we dive into the next few days of setting them up! But with kids and a husband and a house and meals and…and…and… there’s just a lot to do! So, setting up systems saves me time & energy. When I wake up, I don’t have to figure out a plan for that day, because I already know what I need to get done! I can stay one step ahead of the house stuff (when all is going smoothly), and when things do get out of hand, it just takes a few extra hours to get everything back on plan, instead of a few extra days! Then, I’m able to spend the time I do have on the people who need it the most. I know that as moms, the responsibilities we juggle just always seem to keep piling on. We just don’t have a lot of time, and it’s easy to feel like you’re always catching up! But it doesn’t have to be that way. And I’m a firm believer that establishing simple systems is the answer many of us have been looking for! So, if you’re ready to set up some simple systems and routines that will make YOUR home life a lot more manageable, I’d love to invite you to a FREE new mini-course I’ve created just for you! We’ll spend the next few days diving into 3 simple systems that you can quickly implement to begin restoring peace in your home. I can’t wait to dive in with you! Enter your email below to join the course, and then look for the very first email, coming your way soon after that! Join the (free!) Simple Systems eCourse! Enter your info to join the eCourse! 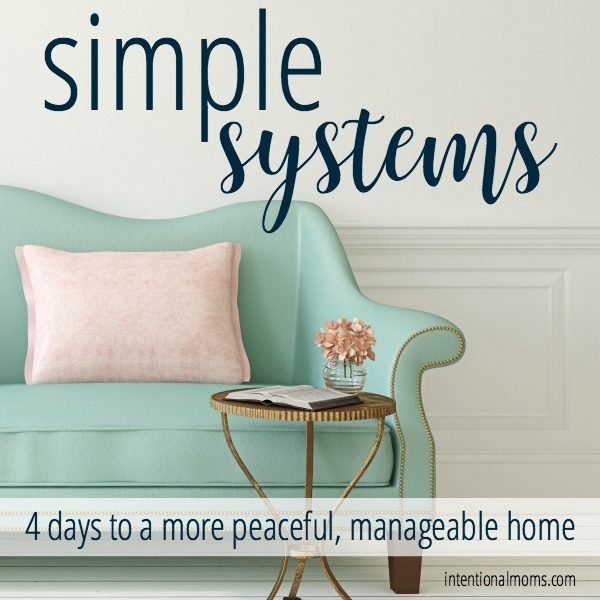 In just 4 days, you'll learn 3 simple systems that will bring peace back to your home. Packed with practical tips and strategies you can implement right away, this course is essential for anyone ready for a fresh start. And it's free! Woohoo! I'm so glad you're interested in our free Simple Systems eCourse! Be sure to check your email right away to confirm your subscription and claim your spot! I couldn’t agree more with you on this, Kayse! Systems have saved me a lot of time, energy and sanity. It is so much easier to not have to wonder what needs to get done.